Returning from my walk one morning I met my neighbour setting out on his walk. We chatted for a while then he suggested that as it was such a beautiful day we should go in his boat over to Gruinard Island. This island is in Gruinard Bay and both my neighbour and I can see it from our homes. We made our way across the bay in a flat calm and landed on the spit at the southern end of the island. 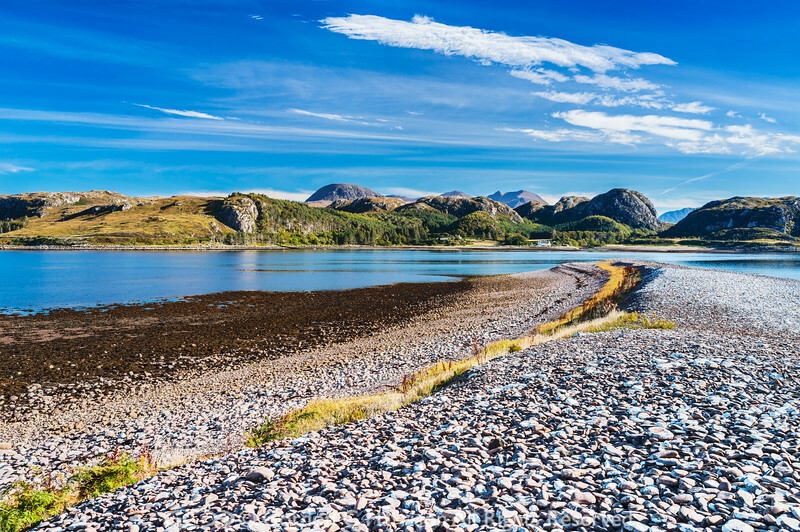 Here the view is of the eastern shore of Gruinard Bay and Gruinard House. Beyond, just rising above the foreground hills, is one of Scotland's great mountains, An Teallach. The pleasure of this little adventure was increased all the more by it being entirely impromptu.